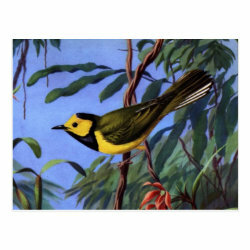 This colorful reproduced painting of a Hooded Warbler is by Chicago bird artist Walter A. Weber. The hues in this gorgeous work have been pumped More... up to make this a vivid and colorful image. This image of the gorgeous warbler is a detail, part of a larger work that featured other wood-warblers (American Redstart and Black-throated Green Warbler).